Our bolsters were born from a need I found while teaching Yoga based rehab at a physiotherapy clinic for a couple years. The majority of my clients had tight chests and weak upper backs, so we were often resting in Supported Fish (see photo at right) or deeper heart openers over a bolster. Many of the clients weren't able to fully open their chests because the 10" width of a standard bolster was too wide. They weren't able to roll their shoulders back and open, which often resulted in gripping, instead of relaxing. You can see in the photo to the right, that the width of the bolster isn't allowing the woman to fully release her shoulders back & down. Another problem I consistently encountered was people's head falling off the back end of the bolster. The standard 24" length just wasn't long enough for about half of my clients, so we were always fumbling with adding blocks and blankets for support & comfort. Not to mention the 5" depth was often causing too deep of a low back bend for the client to feel comfortable. So my mom and I began working on patterns to create a bolster that would solve these problems and still function well in any other pose. After several designs and input from teachers & students we came up with the Long & Lean Bolster. The extra 4" length makes our bolsters suitable for any one from 5' tall to 6'5" tall. Narrowing the width by 1.5" allows shoulders to roll back & chests to open without sacrificing stability. A simple half inch reduction in the depth makes for more gentle backbends. It's not only the size that's making people fall in love with the Long & Lean Bolster. 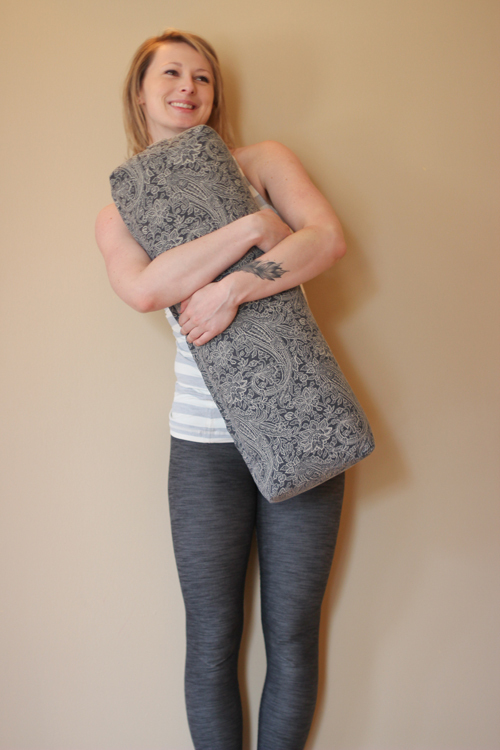 Here are some other great qualities of our yoga bolsters. Thanks so much for reading and thanks so much for liking what my mom and I are doing. We wouldn't be able to do this without you. If you have any questions about our bolsters, or are interested in trying one before you buy it - check out all the locations where our products are used and sold - Locations.